Moillard was bought from the company Bejot in 2016. It is now under Francois Martenot a subsidiary of The Family Helfrich owned Group; Les Grands Chais de France established in 1979. Following the acquisition of Moillard by GCF in 2016, investment and new methods will be implemented with a true desire to respect the Terroir and quality of the wine. In Burgundy, it isn’t enough to be ‘well-born’, you must be ‘well-bred’ too. Historically, Moillard is based in Nuits-Saint-Georges, in Côte de Nuits, bringing you Estate wines (Côte de Nuits and Côte de Beaune,) a signature to Burgundian tradition. The oldest written records of Nuits-Saint-Georges show that the Moillard family already owned vineyards there before the French Revolution. But the firm really took off in 1850 when Symphorien Moillard purchased his first wines to fill an order that was too big for his estate, thus starting his wine brokerage activity. Since then Moillard has been taking all the time needed to vinify and mature its wines so that they reach their full potential. Creating an alliance between respect for generations of skills and know-how at Domaine Moillard and the use of modern equipment, a new winery was created in 2009 in Nuits-Saint-Georges where grapes picked on the greatest terroirs of Côte de Nuits and Côte de Beaune could be brought and vinified. Equipped with small, open, vats, this winery has been set out to keep the grapes whole before vinification. After strict sorting, the best berries are taken to the vats in small containers to avoid any unnecessary pumping. Respecting Côte de Nuits tradition, vatting is long. The wines are treated to several days of post-fermentation maceration at 30°C. Moillard’s red wines are rich! They are rich in colour and concentrated thanks to skilled extraction. This brings lovely structure and power to the wines, allowing great cellaring potential. In its white wines, Moillard aims for complexity in the aromas and flavours combined with finesse. They are fresh and balanced with great length. Moillard has always crafted wines of rare finesse and elegance, faithful to Burgundian tradition. They centre on Moillard’s terroirs and spotlighting the ‘climats’ that are representative of Burgundy. Born in Alsace, Julien grew up in the foothills of the "Rangen" Grand Cru that is world-famous for being one of Europe's steepest vineyard. Fascinated by this terroir and by how men were struggling with it, he very quickly developed a passion for wine. He naturally started his wine career in Alsace, working for the two top-producers there : Arthur Metz and Wolfberger. 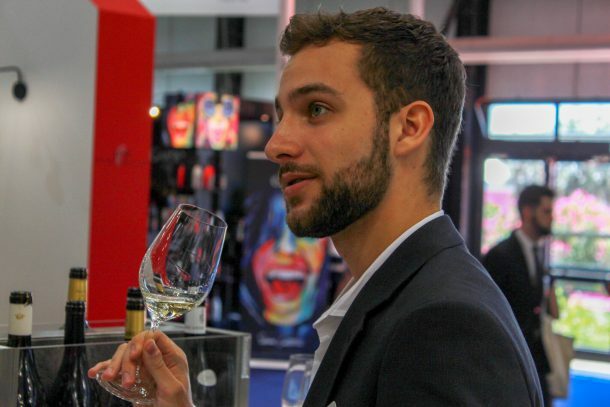 This first experience was fantastic for him and so he decided to go further in this field by establishing himself in Bordeaux in order to study the Wine & Spirits business. There he worked with the Lesgourgues family into developing their premium properties : Château de Laubade, Château Haut Selve and Château Peyros. Thanks to their wine & spirits trading house which was called Maison Léda, Julien was also able to discover Armagnac, Cognac, Whiskies and Rums. In 2017, after 2 years spent in Bordeaux, he moved to Paris to join the Export team of one of Europe's leading wine producer. He spent two years in the french capital and was a support for different markets such as UK, USA, Australia and Japan. Julien just recently joined the Les Grand Chais de France team as a Key Account Manager for the Canadian market and is now based in Montréal. Creating a balance between respect for generations of skills and know-how at Domaine Moillard and the use of modern equipment, a new winery was created in 2009 in Nuits-Saint-Georges where grapes picked on the greatest terroirs of Côte de Nuits and Côte de Beaune could be brought and vinified. Equipped with small, open, vats, this winery has been set out to keep the grapes whole before vinification. After strict sorting, the best berries are taken to the vats in small containers to avoid any unnecessary pumping. Respecting Côte de Nuits tradition, vatting is long. The wines are treated to several days of post-fermentation maceration at 30°C. As soon as they arrive at the winery, the grapes are placed in our presses and immediately gently pressed, the juice is then allowed to settle. Depending on the appellation, the must ferments in thermo-regulated stainless-steel vats (Chablis, Mâcon) or in oak barrels. Regular stirring up (bâtonnage) contributes complexity of aromas and flavours and length on the palate.